The bulletin board just outside Shawnee Country Club’s pro shop had two bits of startling news posted on it on March 24. First, the club’s handicap computer will be up and running on April 1. Members will be expected to post their scores from that day until the close of the golf season in October, as part of the USGA handicap system that governs play on the course. Second, the Shawnee Golf League also starts on April 1, with at least twenty-four twosomes beginning their match-lay contests against each other that afternoon. For now, I am going to assume that the folks in charge are not joking about these two related events, despite the date involved. In both cases, I thought there would be a little more time to prepare for this year’s start, not least of which because of the other, expected announcement on the same bulletin board. Course superintendent Steve Zeveney plans to aerate the greens on one set of nine holes on March 31, and complete aeration on the other nine greens on April 1. The combination could make scoring very interesting in this first round of the League competition, and for the next week or so thereafter. Aeration is a necessary bit of nuisance for any golf course. The process uses a special piece of equipment that rolls over the green, punching and removing small finger-sized holes in the turf. After the little plugs are removed or swept off the surface, the greenskeepers top dress the greens with a sand mixture. In other words, unless a club is happy to have eighteen patches of dead greens later in the summer, aerification is an essential part of the club’s preventative maintenance program. 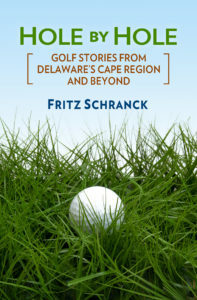 On most Cape Region golf courses, it’s done at least twice a year. At some courses, the superintendents also use a process called verticutting, which is exactly what it sounds like. The temporary results of both techniques are sometimes a bit annoying to experience while playing, especially when a well-struck putt goes bounding off to one side or the other as it hits a plug hole or cut line. This usually only takes place within a foot or so of the hole, immediately after the golfer has convinced himself that he’s just about to make a par or birdie. I fully expect this to occur during our opening match on April 1. The only question is whether it will first happen to one of our competitors, or if my playing partner or I will be the first to enjoy this experience. Fortunately, Shawnee’s greens tend to recover very quickly after aerification. The club’s golfers will soon be back to missing their putts without this particular excuse. In the meantime, there are other things Cape Region golfers can do to prepare for the start of this year’s active golf season. For example, re-gripping the clubs is a sometimes overlooked but often helpful task for the early spring. Old grips can be too slick and too worn, and give golfers the wrong impression about their game. It’s sometimes a pleasant surprise to rediscover the benefits of a fresh set of tacky new grips. Nonetheless, you should check with your local golf professional or the golf guys at Clubhouse Golf and Ruddo’s Golf, before simply regripping with the same model and size grips you’ve been using. For example, my switch to a ten-finger swing also meant an increase to a mid-size grip. The pros can help you pick the correct size, as well as assist you in choosing among the many grip configurations and styles now available.